Really get a kick of all the historical facts and people they sneak in. It’s such a great cast. Have on demand. Where can I see it? Love the show. Was very disappointed when season 11 was not going to be shown in the US, and all of a sudden it appeared in my recordings! Already have seen Eps 1 and can’t wait for all the rest to follow!! Found the show again by channel surfing and was thrilled. I thought it had been taken off the air. Love The Artful Detective. I’ve been watching it for years. I have been waiting for season 11 to be added to ovation schedule. Is Ovation carrying season 11? When is the season for artful detective beginning? In the USA on Ovation I have been watching season 10 awaiting for season 11 to start. First show of season 11 on now and it has Graham calling them fingerprints. Since when did they change over from fingermarks? Also, 10:00 o’clock Saturday night …. really? 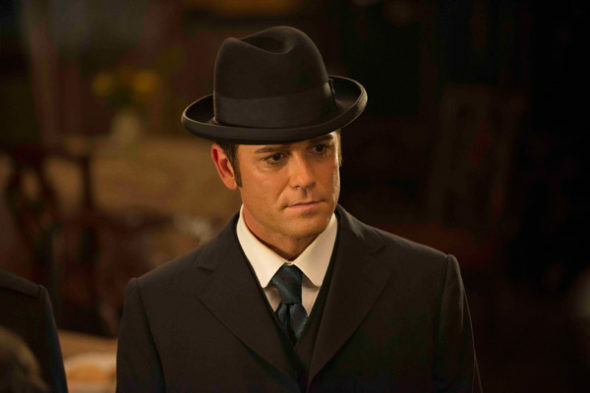 We own every available DVD as “The Murdoch Mysteries” and paid a great deal more with our cable provider to get Ovation. I pray too it stays on in the evening. It is a great show and if I could get the Acorn subscription, I would. As I live in the USA I must be content with their offering. Please keep it onat a reasonable hour in the evening! I was so excited when I saw that Artful was returning for another season. Love the show and its references to real life characters! As of last night, Season 11 was NOT broadcasting on Ovation…any idea when it will actually air?? I wouldn’t miss it for anything! I love this show and its wry sense of humor. Love Johnny and how his character has grown over the years. I agree that it’s one of the reasons I get Ovation and I hope they do not bury this show in an odd time slot. Have been watching every show. so clever. Love the inclusion of historical events and figures.